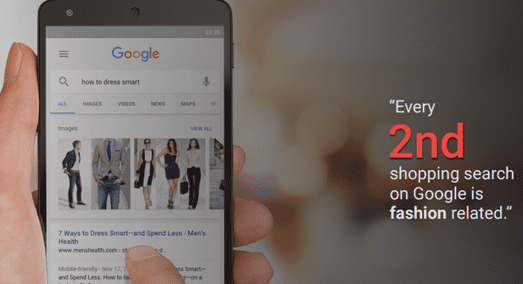 We know it’s early, but these new Google AdWords features and strategies will help create the best out of your festive advertising strategies, that are bound to dominate the competition to close out 2016. Festive season…the worst nightmare and the dearest dream of every digital marketer. Competition is at an all-time high, and the market is flooded with never-ending discounts and offers. However, the festive period also provides a plethora of opportunities with users ready to splash the cash for the right deals. Sooner you plan for the festive frenzy, the better. Proper planning of promotions, catalog and campaigns could give the marketers a head-start compared to the competitors. We have to keep in mind that the customers are also planning well in advance to welcome the festivities. Users start planning for their shopping spree almost a month in advance so that they can sit back, relax and enjoy during the festival time. This makes it imperative for the marketers to plan their activities at least 6-8 weeks before the actual festival. Marketing functions exactly like stock markets when it comes to the festive period. Marketers anticipate an increase in pricing of inventory and in turn contribute to the ever increasing bids. We’ve observed at least 30-40% increase in the CPC of search campaigns across eCommerce for capturing similar average positions. The fight is even more intense for top of the page positions where the bid war is even more intense. Also, holiday season results in an increase in mobile searches. 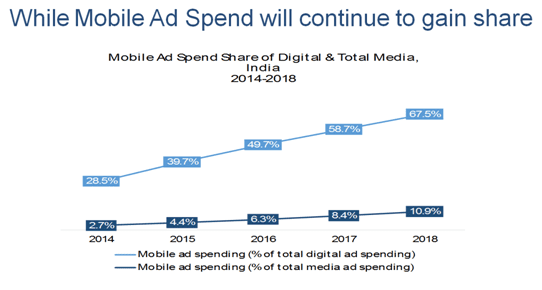 For an advertiser where mobile share is 20-30%, we can expect the same to reach around 50%. 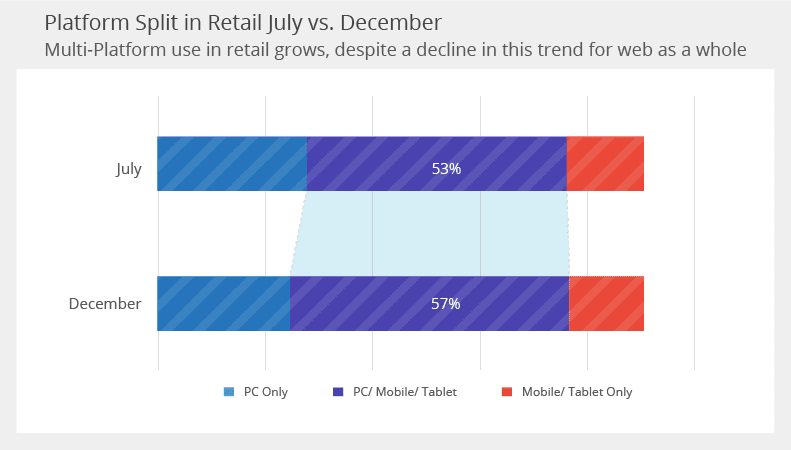 Display CPC might go as high as 40-50% on both desktop & mobile. 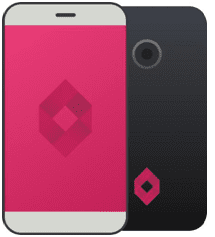 Playing around mobile inventory is the key to effectively reach out to relevant customers. Festival sentiment is best communicated by videoes. most people—nearly 7 in 10—are totally undecided or considering multiple purchase options.On YouTube, purchase guides are a popular and growing trend during the holidays.Videos really do guide gift buying. In the consumer electronics category, for one, 68% of smartphone shoppers turn to YouTube for ideas about what to buy. 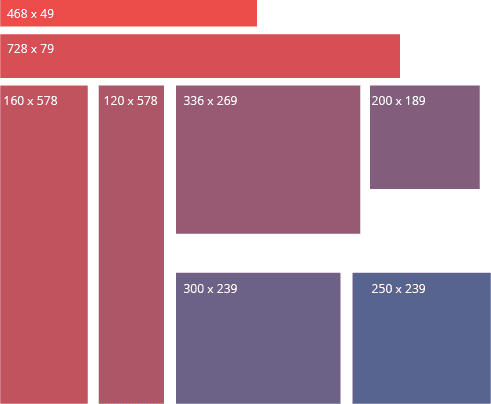 Content on your Site – Give it a Holiday Makeover! With the festive season looming around the corner, there’s no better time to start formulating strategies on how to leave your customers with the best experience on your site. Holidays are typically the most important phase for any company, especially an eCommerce business, and having an exceptional website is just the first step towards driving qualified lead volumes and sales. We’ve compiled a list of Must Dos to prep your website for the oncoming holiday season. With festivals onset, shopping is on top of our audience’ mind. The best strategy could be to analyse the audience behaviour on the website beforehand, and check which categories sell best alongwith which categories. Eg. If an Advertiser analyses that socks sell well along with shoes, then in this case, on the shoes category page showing a pop-up for the socks category could be a good strategy to implement. With Festival Season around, the online marketers’ purchase power & purchase cycle tends to see a change.Festive is a time of the year where users are willing to make a one time purchase of expensive / high AOV products like Cars, Motorcycles, Consumer Electronics, New Furniture. Even though there is an opportunity for everyone in the market, but advertisers tend to encash the most from selling products with high margin categories which generally comprises of high value products. In a country like India, where purchase decisions are mostly driven by emotions, the holiday season comes with a big bonus of reminding your customers about the Indian culture by associating it with your products. Festivities provide you a very good opportunity to reconnect with your current and prospective clients or customers. You can plan out effective marketing strategies during the festivals that will help you in making a better connect with your customers or clients. Ad campaigns for festivals: During festivals like Diwali, Holi and others, develop an innovative ad campaign that highlights your product as a means to celebrate the festivals. Cadbury, for instance came with a new ad campaign for their product ‘Dairy Milk’ during Deepawali through which they tried to put chocolate as a substitute for the Deepawali sweets. And to its contrary, Frito-Lay’s (Pepsico) Kurkure came up with an ad campaign, ‘Muh Kurkure karo’, during the same time, which said that rather than having excess sweets this Deepawali, try the ‘Kurkure’. See more at Franchise India With the increased shopping intent, it becomes very important to pick and choose the product categories which you want to showcase to your customers.While Advertisers like Amazon & Flipkart are seen everywhere on Digital, Offline media, advertisers across verticals don’t leave any stone unturned to grab the customer. Let’s Look at Some Industry Level Focus Categories which sells the Best during Festivals & you as an advertiser must keep an eye at each categories SKUs. Surge in impressions for Laptops, mobile, televisions can be seen where users plan to purchase a lot of products during the pre-diwali period, a lot of college freshmen make their first Laptop purchase during this period. Offering student discounts on such products can help in increasing the sales. High cross sell opportunity – Combo Offers become a must for the Advertisers . Like Laptops clubbed with headphones, offering wireless mouse and keyboards at discounted prices, 50% off on hard disks with a purchase of a laptop could be some of many offers that can be showcased here. Dhanteras is always beneficial for the Jewellery clients. We see a huge surge in sales from Gold Coins, 2 days ahead and beyond of Dhanteras During Dhanteras products like Gold Coins, Rings, Earrings and Pendants are the highest selling products. In Dhanteras 2015, out of 9530 observed jewellery eCommerce transactions majority of transaction chunk was shared among earrings, gold coins, rings and pendants. Details regarding same is given below: Due to increase in purchasing power, many people buy gold coins as investment option, and pre-Dhanteras we usually see a rise in gold coin related search queries. Having a separate Dhanteras + Gold campaign is a great idea. For gold coins we can also provide fast shipping or next day delivery options. Bundling: The sale of products or services together as a combined offering, using demand for the primary product to sell the secondary product. An example is a package/combo deal. This combined product or offer is at a discount so that it is more attractive to buy the bundle than standalone products. Selling a combo meal for McDonalds is a good example of bundled sale. The impact of bundling can be powerful. It normally leads to higher engagement and longer life cycle of the customer. 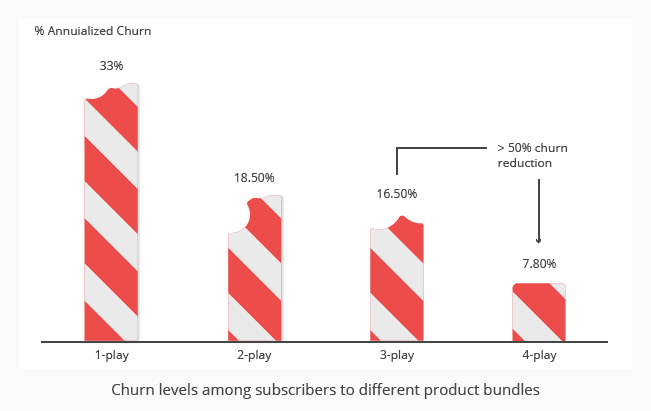 The following figure for a mobile service provider in Europe shows that subscribers opting for a 4-play bundle (4 services) have a quarter of the churn rate as compared to 1-play subscribers. While Google experiments with ‘Shop the Look’*, try designing a combo that includes one of each: clothing, sunglasses, belt, watch or any other accessory. One could also add a discount offer along with it. Maybe even Buy 2 Get 1 Free kind of offers! *Currently available only in the USA. Festivities give opportunities for BFSI to cross-sell add ons and extra coverages along with their products. Including family oriented benefits in the add-ons can help you attract more customers during this season. Eg: Additional coverages for life insurances, and riders like premium waivers. Cash Back offers if insurance is purchased within a specific timeframe. 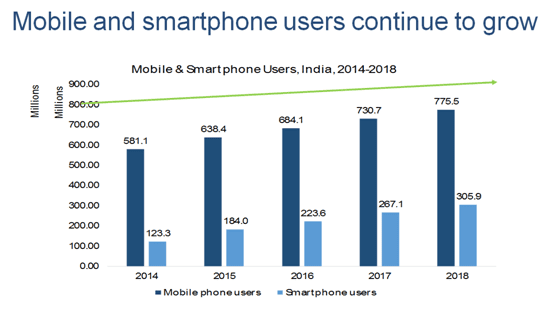 Percentage of consumers using mobile devices We’ve created a new summary showing the global popularity of using different digital devices using data from Global Web Index to include in for our State of Digital Marketing 2015 infographic. 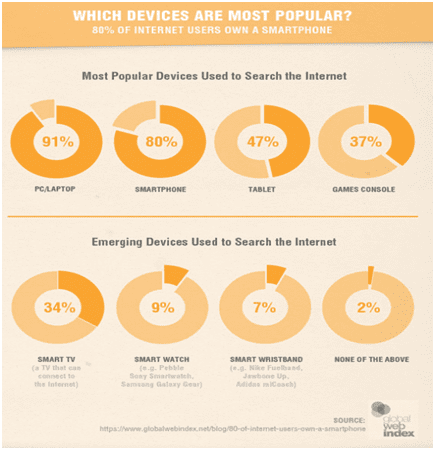 It clearly shows the popularity of smartphone ownership and emerging mobile devices like Smartwatches. 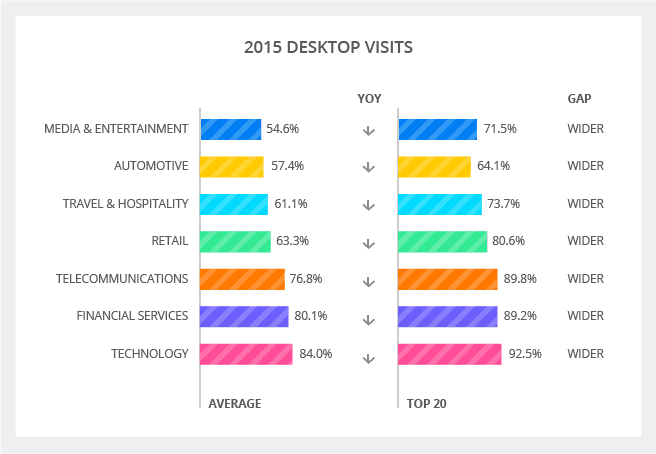 Data Source: SmartInsights 100 mobile users are not equal to 100 tablet or desktop users. In fact, if we’re selling a Rs. 50 product, 100 mobile users are worth Rs. 75 while 100 tablet users are worth Rs. 187.50. That’s Rs.112.50 lost simply because we did not care who was coming to your site. Analyzing how our ads perform across different devices is a core practice for successful PPC advertising. Before now, we could only analyze this data, not target or adjust bids to each device type. OnlineSales.ai for eCommerce serves as performance marketing partners to the biggest online retailers, including eBay, Jabong, ABOF, Caratlane, Tolexo, Snapdeal and Marks & Spencer. Write to us on hi@onlinesales.ai for a demo of our OnlineSales.ai for eCommerce Platform – the all-in-one answer to every E-Tailer’s every requirement. Run a free, 65 point Audit of your GMC and Adwords Accounts, to know how you stack up by industry benchmarks!